Luxurious creamy lentils with warming spices. Ready to eat in just 1 minute. Gorgeous with chicken. 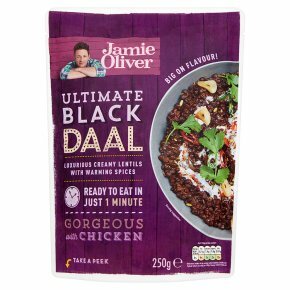 Suitable for vegetarians.We've cooked these brilliant black lentils really slowly to get the most gorgeous and velvety daal. It's gently spiced with garlic, ginger, chilli and warming cumin, making it super-delicious and wickedly moreish, too. Made with Love, Jamie O What's so good about...? Lentils have been around for a long time - thousands of years, in fact. This black variety is super satisfying, tastes great and is a brilliant source of protein and fibre. Lentils work incredibly well in all sorts of curries, soups and salads, or simply served as side with meat or fish. They can take a while to cook, but we've taken care of that! Hints & Tips The gentle Indian-style spices in this creamy daal means it goes beautifully with all sorts of dishes - dotted over a warm chicken salad, teamed with gnarly grilled lamb chops or delicate steamed fish. Finish with a little yoghurt, fried garlic, sliced fresh red chilli and chopped herbs to take it to the next level. Squeeze to separate the lentils then tear 2cm into one of the top corners. Heat on full for 1 min in a 750W / Cat D microwave. Open carefully. Job done!